The GBYLA first started as the Birmingham Youth Lacrosse League in the late 1990's and has grown from two U15 boys teams to over 94 participating teams for boys & girls in 2017. The GBYLA has multiple participating communities that operate under the GBYLA umbrella, but service their own community lacrosse programs understanding the importance for a sense of community amongst those who play, coach, work and follow the game of lacrosse. All community programs as well as the GBYLA strive for the same vision; to be recognized communities of players, coaches, officials, parents and volunteer/staff leaders that foster strong competition, superior sportsmanship, and personal growth for all participants. The GBYLA's mission is to develop & support our youth lacrosse community programs in the greater Birmingham area. In 2010, the GBYLA partnered with the Positive Coaching Alliance (PCA); a national non-profit developing “Better Athletes, Better People” by working to provide all youth and high school athletes a positive, character-building youth sports experience. Our relationship continues into 2018 with ongoing workshops for coaches, parents & players as well as the continued reinforcement of the PCA principals for good sportsmanship. Spring Season - Our main lacrosse season and in 2017 it involved 94 teams of boys and girls from 1st grade through high school. In season play runs from early January thru early May. 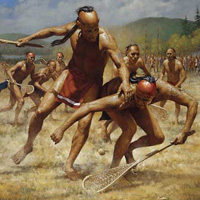 Fall Lacrosse - Having now completed thirteen years, Fall Lacrosse offered an opportunity to introduce new players to the sport and provided existing players a chance to refine their skills in scrimmage play. Fall Lacrosse 2016 registration produced over 435 boys and girls ranging from 1-12th grades. In 2017 our Fall Lacrosse format changed with emphasis solely on the new player. Registration for 2017 topped out at over 190 new boys & girls. The GBYLA Website also contains information on local camps and clinics as well as out of state camp opportunities during the summer months. Information on recruiting showcases and tournaments can also be found on our website. We are constantly working on new and exciting programs for our youth players, so please stay tuned to the website for up to date program information. We can also be found on Facebook & Twitter!